Congratulations to "Mandy B", the winner of Lena's giveaway. Thank you to all who participated! When I thought up the concept for my debut novel--He Kills Me, He Kills Me Not--I didn’t plan to start a series. My goal was to put a unique twist on a favorite trope of romantic suspense--serial killers. My idea? Have the killer pluck the thorns off a rose one by one to decide whether or not to kill his victims. That made me think of the nursery rhyme and childhood game of “He loves me, he loves me not”, which then led to the title of my book. Readers of that book wrote to me asking when Pierce and Madison--secondary characters in He Kills Me--would get their own book. So I decided to propose a sequel. Since my first book had a killer playing a game, I thought it might be fun to do the same thing again. Thus, book two became Simon Says Die. I think you can see where this is going, right? By the time the second book came out, I realized I had the start to a series--especially after readers read Simon Says Die and began clamoring for books about Pierce’s brothers. I decided to tie the books together by making sure the title of the next one was consistent with the first two. Thus, the Nursery Rhyme series was officially born. The third installment comes out next month. The title? Ashes, Ashes, They All Fall Dead. And a fourth book is planned for 2014, with another creepy nursery rhyme title. Stumbling into a series is not a path I recommend. It’s make planning for future books, and figuring out ways to tie the books together, a bit more difficult than it would have been if I’d planned this from the beginning. But seeing how well this particular series has been received--not to mention how much fun I’m having writing it--I wouldn’t change a thing! Do you like to read books in a series? If so, what are your favorite types of series--ones that focus on a location (like a small town), ones that focus on a family connection between the characters (like the heroes are all brothers), or ones with something else in common--like that all the books have Nursery Rhyme titles? Or is there another kind of series you enjoy that I haven’t listed here? 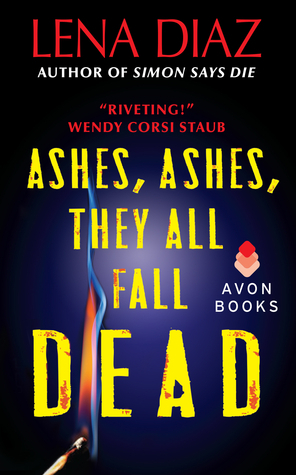 One commenter will be gifted with a pre-order of an electronic copy of my September installment in the nursery rhyme series--Ashes, Ashes, They All Fall Dead. Below is an excerpt from Ashes, Ashes, They All Fall Dead (release date September 10). Hot, greedy tongues of flame licked around the eaves, teasing, tasting, like a new lover hungry for a first caress, ravenous to join with the tantalizing flesh of the woman lying inside the house. The beckoning inferno drew him across the dew-laden grass until the heat was so intense he was forced to step back. He lifted his face to the sky as the first ashes fluttered down, brushing softly across his skin like a warm breath, a gentle kiss. He captured the sooty flakes in his hands, the familiar, acrid scent making his nostrils flare. The comforting crackle of the fire subtly changed and he cocked his head to listen. No, the fire hadn’t changed. Those were sirens, the high-pitched whine mingling with the dull roar of the flames. He crushed the pieces of ash in his palms, picked up the gas can, and loped across the lawn to his truck. Too late. They were too late. They were always too late. And soon, he would have his revenge. Ashes, Ashes, They All Fall Dead. The stacks of letters cluttered the top of the conference room table, each one a bleak epitaph to a life stolen, a life lost, a life destroyed. FBI Special Agent Tessa James slid one of the pages toward her, gingerly running her latex-gloved finger across the words. A name—Sharon Johnson. So simple. So short. So inadequate. Beneath it, a killer’s irreverent gloat, “Ashes, Ashes, They All Fall Dead,” followed by an odd little curlicue, like someone would make when doodling, except that it was on every letter. It seemed obscene that his words, and his mark, sat on the same pages as his victim’s names. Even in death he wouldn’t let them go. Giveaway ends 11:59pm EST Aug. 21st. Please supply your email in the post. You may use spaces or full text for security. (ex. jsmith at gmail dot com) If you do not wish to supply your email, or have trouble posting, please email maureen@JustRomanticSuspense.com with a subject title of JRS GIVEAWAY to be entered in the current giveaway. Cindy, I'm the same way about wanting a new hero and heroine in each book of a series. After all. It's still a romance even if there are killers running around. Great seeing you here today! I'm a big fan of books in a series and have each of your examples represented on my shelf. There's something about revisiting a town, characters we really like or a particular theme that's pretty appealing to me. Lol! You know I understand what you mean. I love this series! You are one of the up and coming new writers. I predict a brilliant future for you. Anyone who has not read your books, do it now! Trust me readers, you will not regret it! Marijane, you are so sweet. Thank you so much! I can't wait for this book to come out! You had me hooked as a fan since SIMON SAYS DIE. Music to my ears! Thanks Mary. Wow... this is a double treat! Ms Lena Diaz on JRS! I can't wait to read Ashes, Ashes They All Fall Dead. After all, it is the 3rd installment in my favorite series. A mix of new and old heroes and heroines in a familiar setting lets the reader keep old friends, make new ones and all while the story and plots keep moving forward. It is an art that you have perfected Lena! Julie, hi! (Cyber waving) I'm so glad you enjoy my stories. Can't wait to see what you think of Ashes. It's my favorite so far. I'm totally in love with Matt, the hero of this one. I haven't read any one of your books but based on the very good reviews for this book series, I am going to give them a try. Thanks for the books' description and the giveaway. Kai, awesome! Hope you enjoy them! I've just added to series to my must read list. Just fantastic. Loved the first two Nursery Rhyme mysteries - looking forward to reading the third. I enjoy the three types of eries you mentioned. I also enjoy series with the same H/h - one of my favorites is the In Death series. Taurus, I still haven't read any of he J.D.Robb In Death books. But I read a lot of Nora's romances. I guess I just need that central love story with a different main couple in every book to feel satisfied. Hi Lena. Unfortunately I have not had the pleasure of reading your series, but I just bought the first one!!! Based on your reviews, I can't wait to begin this journey!! I prefer to read series myself. I enjoy continuing the connection with each new book. My favorite type of series is a connection between the people in each book. But I am not really picky. :) thank you for this opportunity. Mandy, thanks for taking a chance on me. I hope you love the series. I too love connected stories and am really glad to hear so many people saying they do too. (Blush) Thanks so much Trish! I just stopped by to say that I loved "He Kills Me, He Kills Me Not" and "Ashes, Ashes, They all fall Dead"! Your books introduced me back to thrillers. Keep on writing those intriguing stories that keeps us in suspense! Nicole, I was thrilled to have you read an advance copy of Ashes. So glad you enjoyed it! I am collecting your books. Your titles are quirky & fun! Thanks Janet. Searching through nursery rhyme books to come up with new titles every time is half the fun! I've been wanting to try this series! Thanks for sharing and congrats to Lena on the new release! Erin, this is the best time to try this series. The first book has been down priced to only 99 cents! And Ashes is temporarily down priced at $1.99! Hope you enjoy my books! I'm a huge fan of series and am stoked when an author turns what started as a standalone into a series! I enjoy both series with the same couple in each book (though it's a challenge to keep it from feeling staid after a few books and not everyone can pull it off; Nora's IN DEATH series is the obvious example of this type of series done right) and ones with different characters in each book. Basically, I'm a series 'ho :). Loved the first 2 books, and can't wait for more creepy nursery rhymes! Hi Cris. I guess I'm going to have to force myself to start reading the In Death series since I may be the only person on Earth who hasn't read it. I'm so glad you enjoyed the first two nursery rhyme books. Fingers crossed you'll love the next one! I've pre-ordered ASHES since I'm such an uber-fan of your Nursery Rhyme series...can hardly wait! I'm presently in the process of writing stand-alones, but they are in a broader "Adrenalin Junkies" series/category. An Olympic Skier, a world champion surfer and I think the third will be an MMA fighter. Thanks Sarah! I adore writing connected books with recurring secondary characters. I think it's so fun. I also love doing the unexpected with the worlds I build. For example, my Harlequin Intrigue (Tennessee Twostep-February 2014) mentions a fictional town and character in a conversation the hero has--but the fictional town and character are actually from a fellow Intrigue author's books! (Yes, I got permission.) I'm also using Alex Buchanan, a lawyer from the Avon Nursery Rhyme books as a lawyer in a Harlequin Intrigue that comes out next year (May 2014). Again, I had to get permission, but my publishers were both cool with it. I think it's fun for readers to see crossover characters like that. Thanks for your kind words. I look forward to reading your stories too! It's Tennessee Takedown, not Twostep! Geesh. Can't even remember my own book titles. Lena your nursery rhyme series is awesome! I can't wait to read Ashes Ashes! Congratulations and hugs! Thanks so much Carey! Your debut novel First Do No Evil is still one of my favorite romantic suspense novels ever! Hugs right back at ya. Hi Rachel! So nice to hear. Be sure and let me know what you think of Ashes! These books sound great! I love the nursery rhyme angle! Thanks for the giveaway. Thanks for stopping by Jaclyn. Maureen, thanks again for allowing me to visit JRS. And thank you all so much for stopping by to chat and make sure I didn't hear crickets out there in cyber-space all by myself on the blog! Good luck in the drawing. And I hope you will all consider reading Ashes, Ashes, They All Fall Dead on September 10th!